Nifty higher open interest shifts from 4900PE to 4700PE. Sell signal holds in all the time frames but still PE writers are confident of holding 4700 as a support zone. 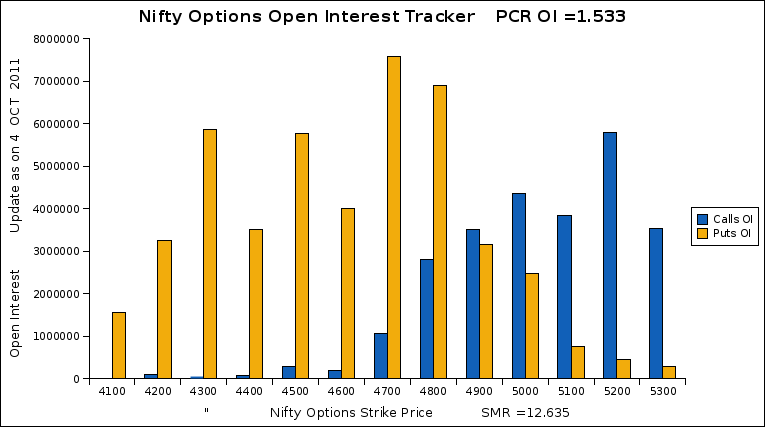 One thing should be noted cautiously initially put option writers build higher open interest in 4800PE later they shifted building Open interest on 4900PE and now they are building on 4700PE strike prices. which indicates that 4800PE and 4900PE are written for shorter term. I am using google docs to import the NSE -- NIfty Option Chain into google spreadsheet by using import html function. It is not returning any value or data. Pls find the following url i am trying to import. I am able to use edit query & import data into MS spreadsheet. Can you pls let me know how to do it in google spreadsheet. Thanks Rajendran. I will check with the link provided by you & update you on the same. Thanks once again. Thanks rajendran..able to extract option data using your link.. I tried to use the =IMPORTHTML(ʺhttp://nseindia.com/marketinfo/fo/optionKeys.jsp?symbol=NIFTY&instrument=-&date=-%E2%80%9C,1ʺ,ʺtableʺ,4) command. Please can you elaborate on this and help me out! You NSEindia website protects their data from parsing the data using importhtml command. I’m unable to use the link http://nseindia.com/marketinfo/fo/optionKeys.jsp?symbol=NIFTY&instrument=-&date=-“,1 to get option data into the google spreadsheet. can you please help me with any other option.